Untold story about adoption of Bemberg™ for Gunze Kaiteki Kobo: "Hada-Sarari Series"
Kaiteki Kobo is a brand of long-selling underwear from Gunze. Using natural fabrics such as cotton and wool, the products have been popular with people of all ages due to their soft texture. Gunze implemented a brand renewal of Kaiteki Kobo last year and released the "Hada-Sarari Series", the first series of products in the brand using chemical fibers, in response to demand for underwear that remains smooth and dry even when the wearer perspires. 4 features of "Hada-Sarari Series"
It remains smooth and dry even when the wearer perspires. The underwear dries quickly by rapidly absorbing perspiration. It reduces the stuffiness by heat & humidity felt by the wearer. The underwear is antibacterial and anti-odor, remaining clean and reducing the smell of sweat. Kaiteki Kobo underwear from Gunze has numerous fans who have been using the products for many years. The brand is seeing an increasing number of users who demand functionality of the products, such as sweat absorption and the reduction of stuffiness by heat and humidity felt by the wearer, while placing emphasis on their smooth texture. Acticot, an original combined yarn of polyester and Bemberg, was selected as a material that would fulfill the strict criteria of these Kaiteki Kobo fans. Acticot is an original composite yarn that is made by texturizing polyester and Bemberg densely, which is a patented technology of Asahi Kasei. 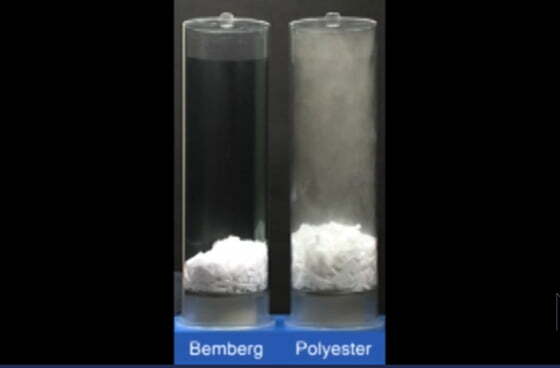 Bemberg absorbs sweat, which is quickly dissipated by polyester. The adoption of Acticot enables moisture absorbing and releasing properties exceeding those of 100% synthetic fiber materials (common synthetic fiber underwear made of 85% polyester & 15% spandex) ,while maintaining a water-holding ability that is equivalent to that of 100% cotton fabrics. The attractive feature of Acticot is felt in a setting when the wearer makes sweat, such as when they go out in summer. This material fulfills the most important function of underwear -- that is absorbing sweat. At the same time, it keeps the wearer's skin smooth and dry by releasing moisture immediately. In recognition of this property, which prevents the underwear from sticking to the skin, the "Hada-Sarari Series" was added as a new lineup to Kaiteki Kobo, for which only natural materials had been used. You will notice the first feature of Bemberg as soon as you touch it. It is the smooth surface texture that you feel when you touch it. The round cross section of the fiber, which is distinctive when compared with other fibers, is also an important aspect. It is also a low-friction material, which keeps the stimulus to the skin low even when it is in friction with the skin. This results in the gentleness of the material, which does not harm delicate skin. Look at the cross section and surface of each material shown in the above photos. Bemberg has a smooth surface and a cross section that is almost a perfect circle. Unlike natural fibers, Bemberg does not have uneven thickness. Bemberg is, for example, a fiber that breathes deeply. It rapidly absorbs moisture through invisible, extremely small water pathways and releases it into the air. This is why Bemberg does not stick to the skin or make the wearer feel stuffy by heat and humidity. A great feature of Bemberg is its ability to keep the temperature inside clothes comfortable for the wearer. It keeps the wearer pleasantly cool in summer and warm in winter. In addition, it also controls the generation of annoying static electricity, keeping the wearer comfortable all year round. → Learn more about Gunze Kaiteki Kobo: "Hada-Sarari Series"